Day 3 and McCulloch’s is looking good!! Yesterday proved to be a bit challenging for the carpet installers what with some of the walls and pillars creating extra obstacles for them to work around. They kept at it and did a great job however, and we’re excited with how smooth this whole process is going! 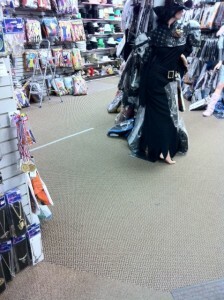 Yesterday’s focus was on the Novelties and Costume sections of the store. Here are some before and after pictures. You may notice there are a lot of walls missing from the store. These were non-permanent walls that thankfully with a little work and sweat we were able to tear down temporarily so that the carpet could be installed a little easier. All of the merchandise was moved to the front of the store or to the basement, which of course made shopping a bit of a challenge for our customers. From all of the feedback we received yesterday however, it seems as if this wasn’t a problem for most as our awesome staff were ready to handle all of our customers needs and get them what they wanted! 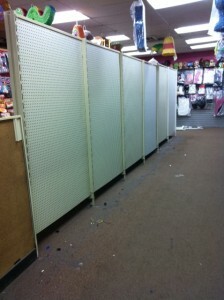 Center Aisle merchandise removed and relocated; walls are ready to come down! Walls removed. 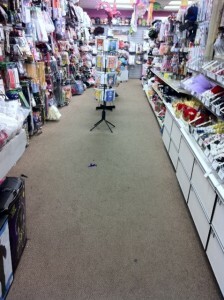 This view is from the corner of the wig aisle looking towards the front of the store. All merchandise staying on the permanent walls have been lifted up from the floor. 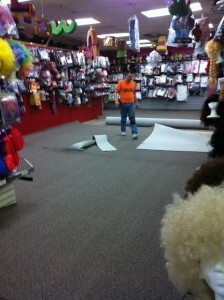 All carpet removed from wig and center aisles of Novelties. 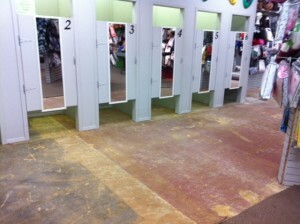 Cement patches completed ready for new carpet! 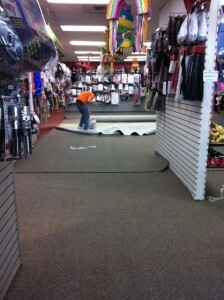 New carpet is going down in wig and center aisles! 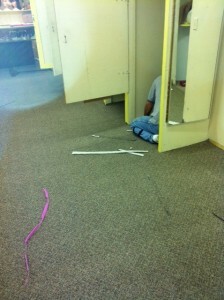 Center aisle getting new carpet!! 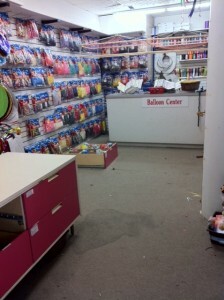 Wig and Novelties Aisles are all done!! Time to bring the walls back in!! 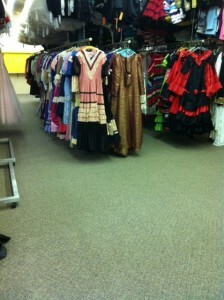 Area near the dressing rooms and kids costumes. 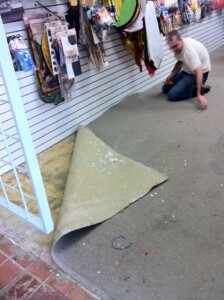 Thankfully duct tape and throw rugs will no longer be needed! And just like that it's done! No more duct tape or throw rugs needed!! 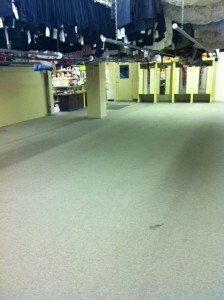 All Dressing Rooms are prepped and ready for the new carpet! Dressing rooms are complete! 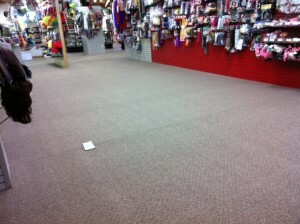 New carpet is down and ready for customers to transform themselves! 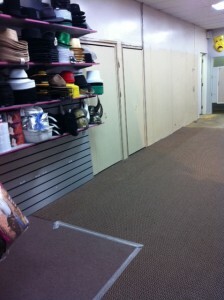 Costume area leading to the hat wall. 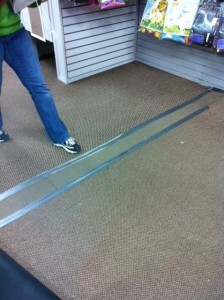 Notice more duct tape as well as three different types of carpet! 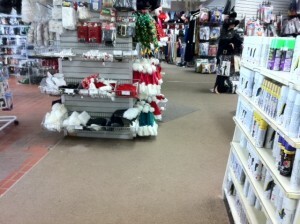 Another view of the costume and hat aisle with the different types of carpet. 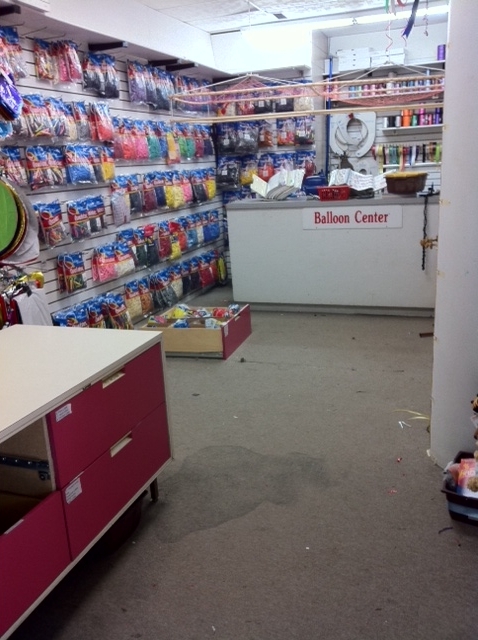 This part of the store actually used to be part of the Dancewear Department up until three years ago when the wall was taken down and four slant walls erected in its place. At that time 4 more dressing rooms were also added. 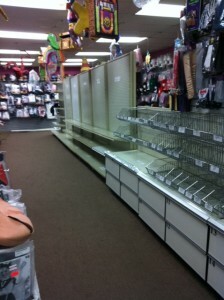 Hat wall with all inventory moved and shelving units removed. We found two closets behind those walls! The carpet installers have a day off today while we play catch-up. 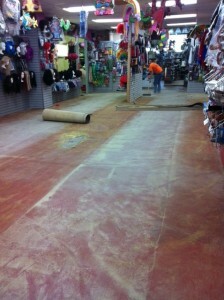 We’ll be putting parts of the store back together again and getting inventory back where it needs to be. 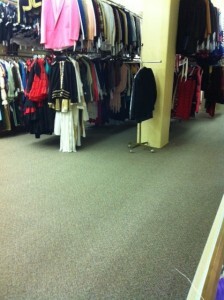 We’ve also got to get Dancewear ready to go, as well as everything behind the front counters. 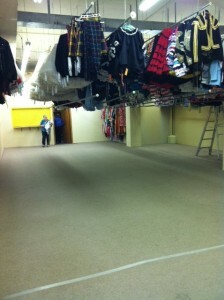 Tomorrow the carpet installers will finish in the area of the adult costumes and move right into Dancewear from there. This is one of the projects that could unearth all kinds of headaches as you go on, but so far it has been smooth sailing! Check back tomorrow for more photos! McCulloch’s is getting a new look! 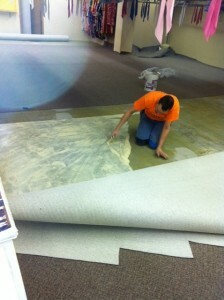 It is Day 2 of the carpet install, and so far things are moving quite smoothly! We’ve got a great team of guys here doing the work and it looks as if we will finish on schedule. Tear-out is underway! Go Dale! New floor is in and ready for wax and sealant!! 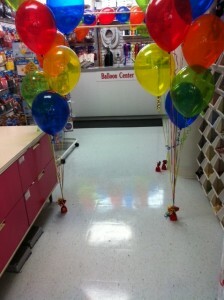 Balloon Center completed with new floor!! For those of you who have visited the store, you know how large the Rental Department is. With everything cleared out and moved in preparation of the carpet installation, you can really see just how large this space is. We contemplated getting the staff together for a game of hockey, but decided the owners probably wouldn’t have approved. 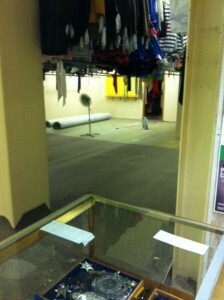 Before shot of Rental Department. Remember all of those lines of duct tape?? All lower racks of the Rental Department have been moved and relocated. Ready to go! 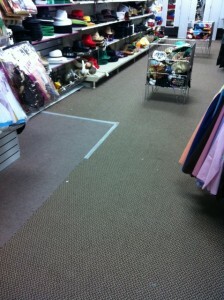 Front view into Rental Department before tear-out. Hockey anyone?? 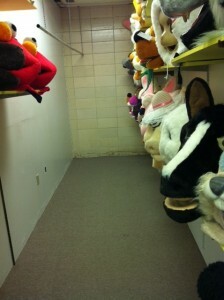 The Mascot "Head Room" is even cleared out and ready to go! 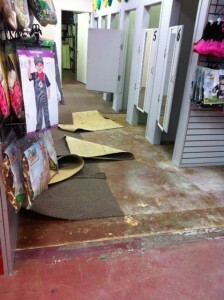 Old carpet torn out of rentals, cement patches done, and new carpet is ready to be put it! These guys are working fast. The Rental Department is shaping up! 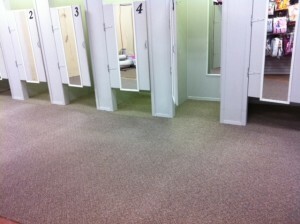 New carpet for the change rooms! New look for The Rental Department! 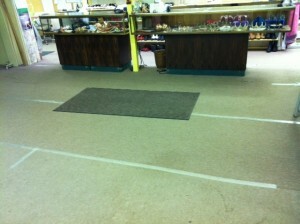 Carpet is in and inventory is being put back into place. Entry view to The Rental Department. All finished!! 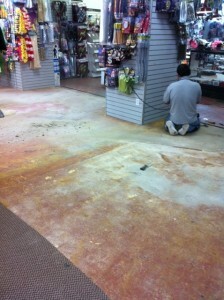 Today the Novelties section of the store is being done, which is proving to be a bit of a challenge for our customers. Our customer service is being stepped up a notch to make this as easy as possible for everyone. When you come to McCulloch’s over the next few days you will be greeted by a sales associate who will become your personal shopper! Tell us what you need and we will go and gather everything you need and bring it to you at the front of the store. Not too bad if you ask me! 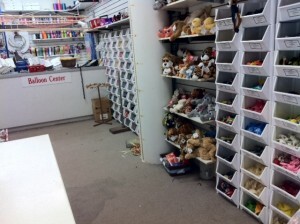 Tomorrow we will post pictures of the Novelty Department, and then it’s off to the Dancewear Department! McCulloch’s is getting a facelift! For those of you who shop in our store, you will be quite surprised by our new look in the next week and we hope you will like the change! 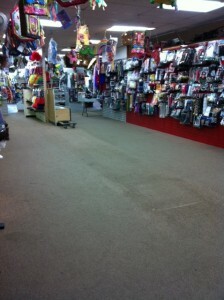 Our staff have been busy moving everything in the store around to facilitate our project of replacing all of the carpet. We will be doing all of this work and keeping the store open so that our customers can still be catered to. 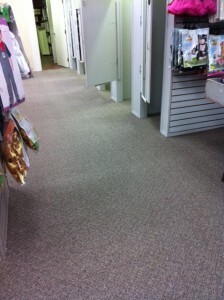 While it may look a bit disorganized, we still have all of our products and services available to you. Please be sure to ask one of us for help in finding something. It’s all here, but nothing is where it should be. 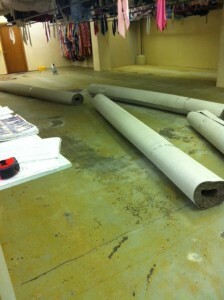 Our Dancewear, rental and novelty departments will all be getting new flooring. 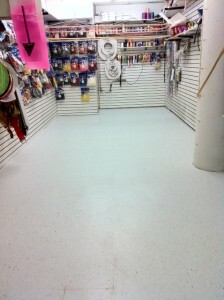 Our balloon center has already had new flooring installed and looks fresh, crisp and clean!! We hope that this will give a nice fresh and inviting appearance to our store and make your shopping experience more of a pleasure. McCulloch’s is hitting their 50 year mark in a few months, and it seems only fitting to give the store a bit of a much-needed facelift! As stated earlier, we want to remain available to all of our customers so our hours of operation will not be affected during this remodel project! It may be a little hectic, but we will do all we can to ensure your shopping experience is still a positive one! Stay tuned for more updates!